My first impression of the hotel has always been grand, lavish, first-class and luxurious. So, I was naturally excited as this was my first 5-star luxury hotel stay. Much to my surprise, it turned out to be truly enjoyable and family-friendly – totally exceeded my expectations. The Fullerton Hotel will always hold a special place in my heart. We stayed in a Straits Club Quay Room on the 4th floor with exclusive access to the Straits Club Lounge. When we walked-in, we didn’t expect our room to be this HUGE! On the left, there is a beautiful big bathroom with an enormous bath, and on the right, there’s a changing room with wardrobe, safe and resting chair. And here’s our room – tadaa! It’s SO spacious, even with an extra bed, there’s still plenty of space in the room. From soft vanilla coloured walls to freshly-pressed sheets, everything in the room was undeniably luxurious. The huge and super comfy bed also comes with 9 pillow selection – with some unique ones such as Jade pillow and Tatami pillow. Now, everyone can sleep to maximum quality. Speaking of details, besides the fully-stocked mini-bar, coffee & tea making facility and fresh fruits, I was absolutely surprised to find a handwritten welcome card from the General Manager of the hotel. Wow! 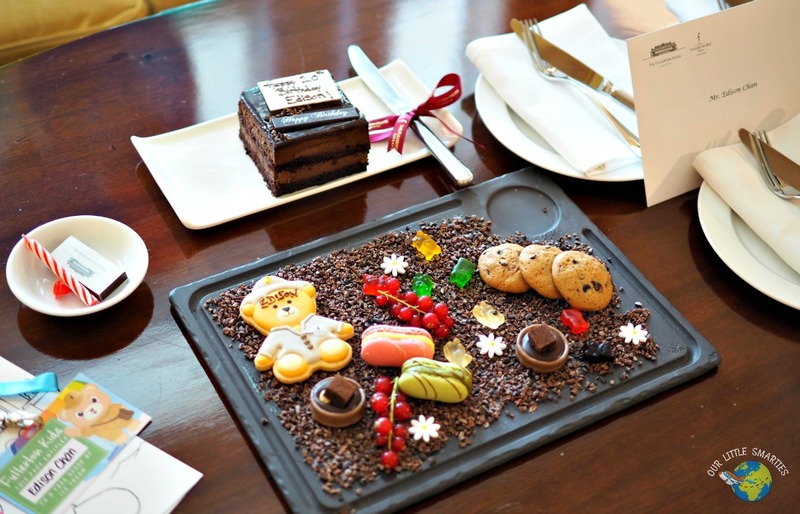 Knowing that we were here to celebrate Edison’s birthday, the hotel staffs have specially prepared a birthday surprise for him. 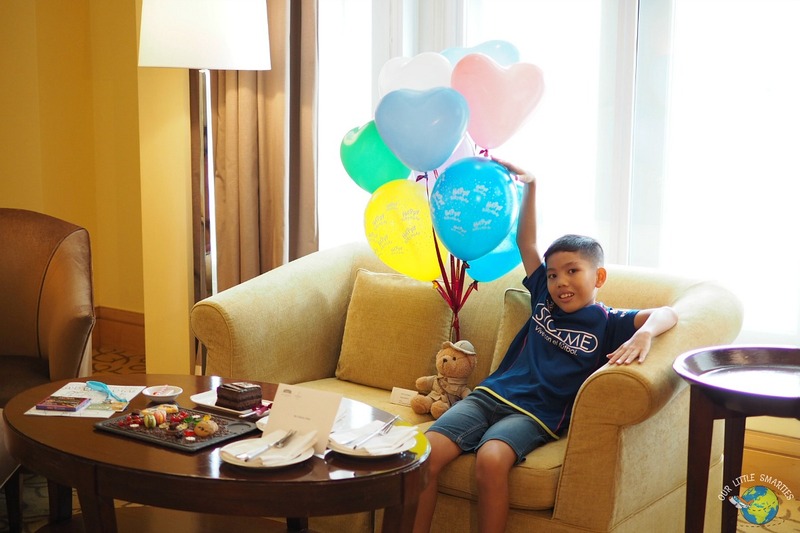 From colourful birthday balloons to handwritten birthday card, Fullerton Bear plush toy, and yummy birthday cake and treats, everything was so personalised and made our boy felt extra special on his 10th birthday. To further delight him, he received a colouring book, colouring materials and an ice-cream pass during check-in. 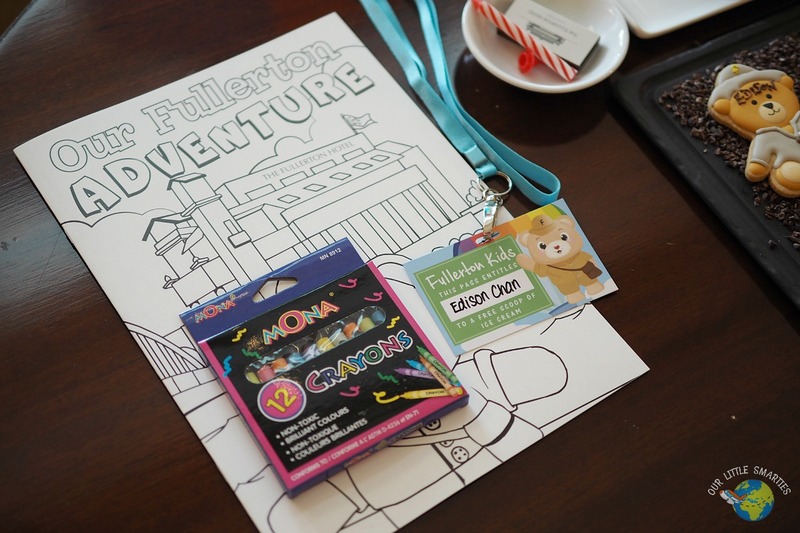 The colouring book isn’t an ordinary one but it’s themed One Fullerton Adventure. As he coloured and solved puzzles in the book, he learnt more about the hotel and its surroundings. 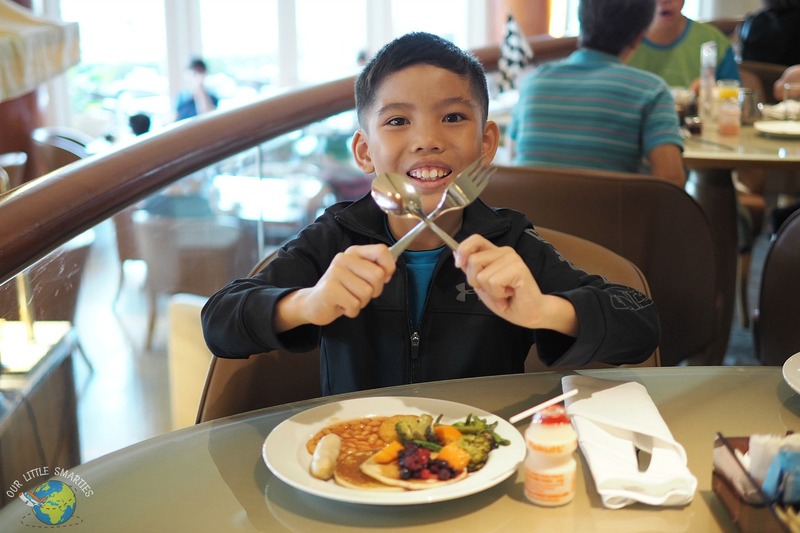 The ice-cream pass allows him to redeem a scoop of ice-cream daily at Town Restaurant. What a fantastic way to treat our little ones! 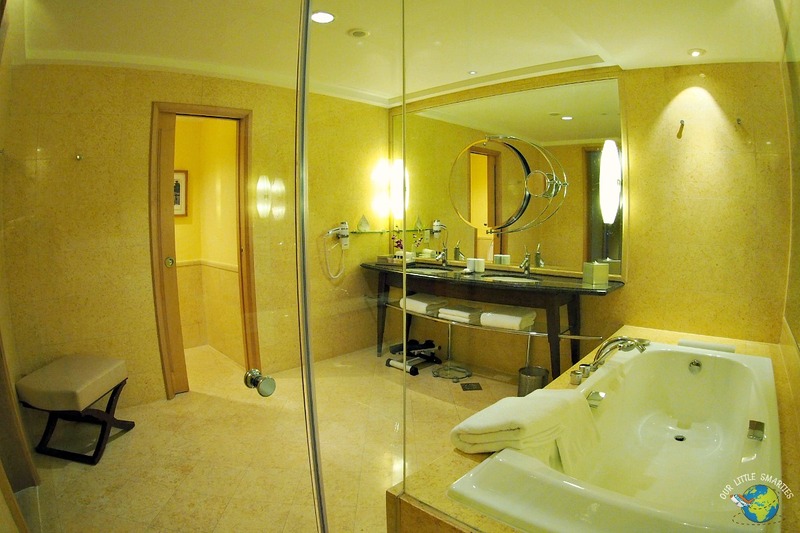 The bathroom also deserves some highlight, much because of its enormous size, giant bath tub, rain shower and elegant décor. Hotel toiletries rarely satisfy me, but this one certainly did! 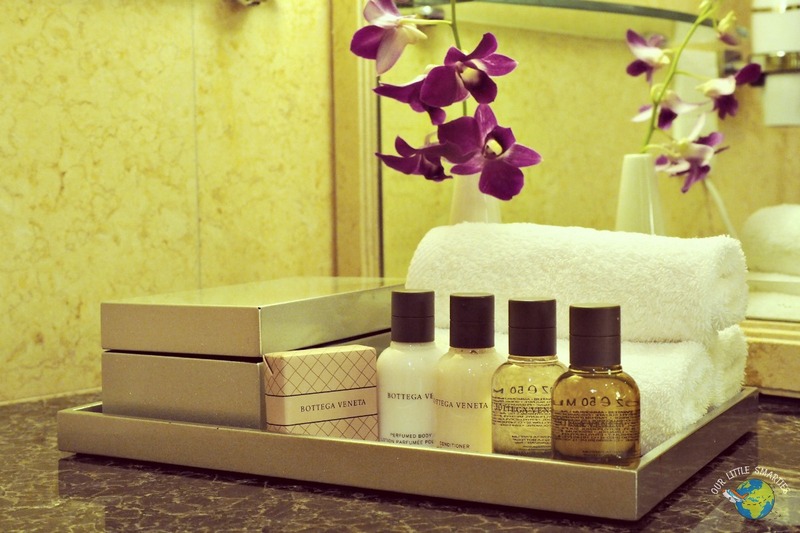 The luxurious Bottega Veneta bath amenities are so PERFECT. 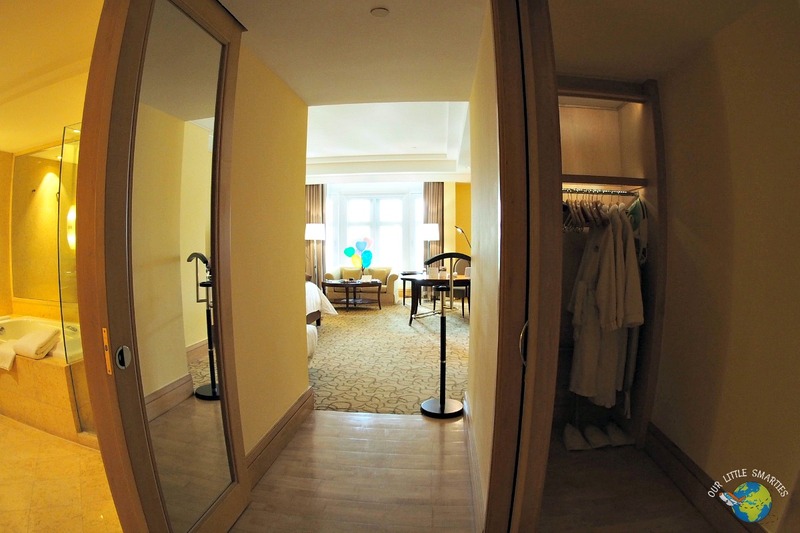 During the heritage tour, I understand that The Fullerton Hotel is a heritage building, hence guestrooms and suites within the same category are all uniquely configured. These are all the privileges that guests can enjoy under the Fullerton Family Package and Book Direct Benefits. 30% off à la carte food bill at restaurants after 6.30 p.m.
Before I go on to the next sub-topic, we also love the afternoon tea, evening canapes and cocktails served in the Straits Club Lounge. If you prefer privacy, you can choose to have your daily Champagne breakfast here but obviously, we prefer the Town Restaurant (will share more about the restaurant later). 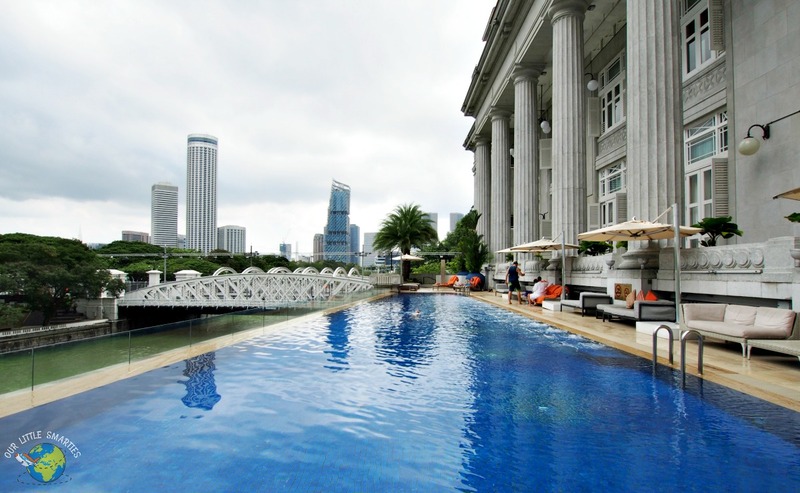 The Fullerton Hotel is a luxury hotel located in the heart of the Central Business District. 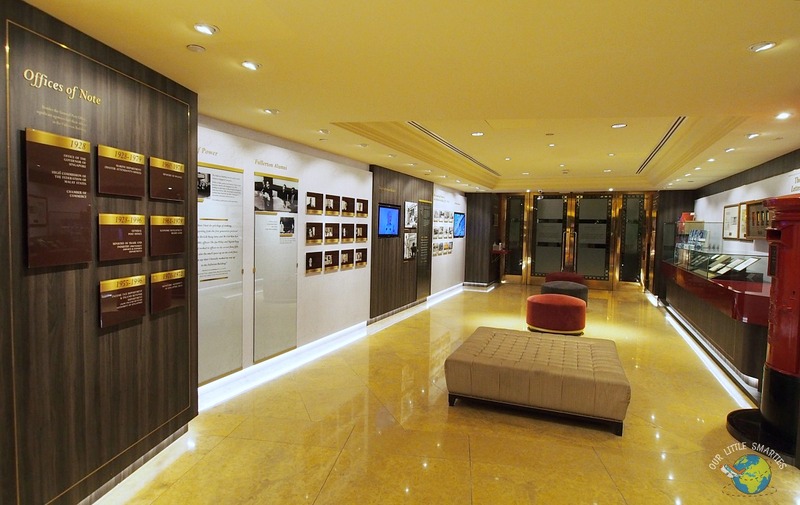 This space was once the home of the former post office, government offices headquarters, clubs and its square was staged, in the 50’s, to some of the most important political campaigns that led to Singapore’s independence. 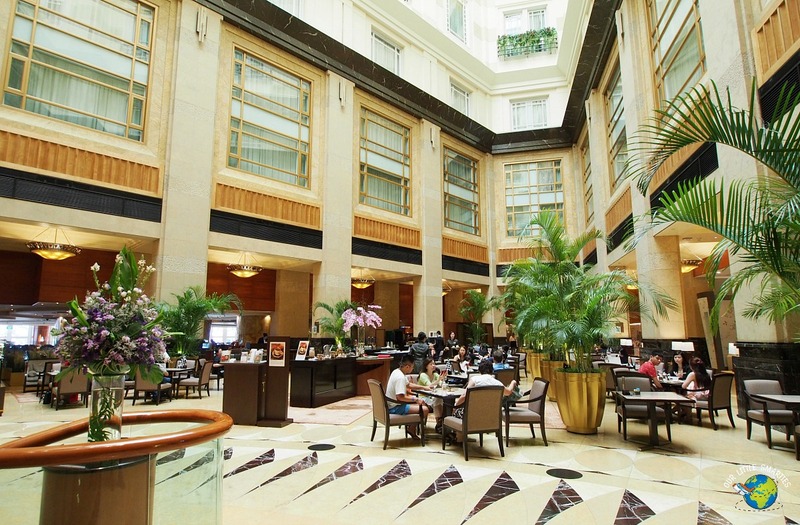 In 2001 after a S$400 million restoration, the building was opened as one of the most iconic hotels in Singapore. As we can see, the hotel today is a perfect blend of the old, wired with the new. It’s amazing how the authentic details of the legendary building were meticulously restored, from the Doric columns to coffered ceilings, cornices and Italian marble floors. Combined with the highest levels of luxury and technology, guests can enjoy a refreshing ambience of peace and tranquillity with its contemporary and stylish décor. If you haven’t been to The Fullerton Hotel, I highly recommend that you give it a visit. 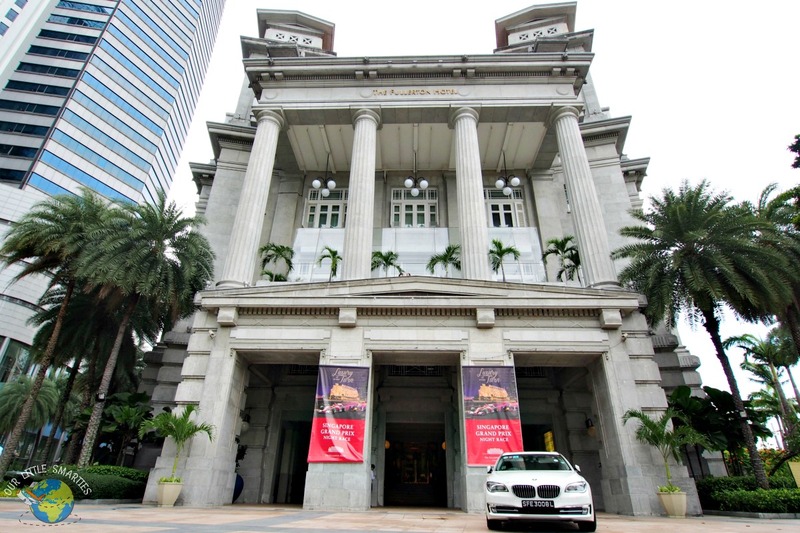 The Fullerton Heritage Gallery is opened to the public from 10am to 10pm daily. You can find rare postal archival materials dated back to 1960s as well as activities tailored for kids. It’s truly a platform for the young ones to learn about Singapore’s heritage in an engaging manner. 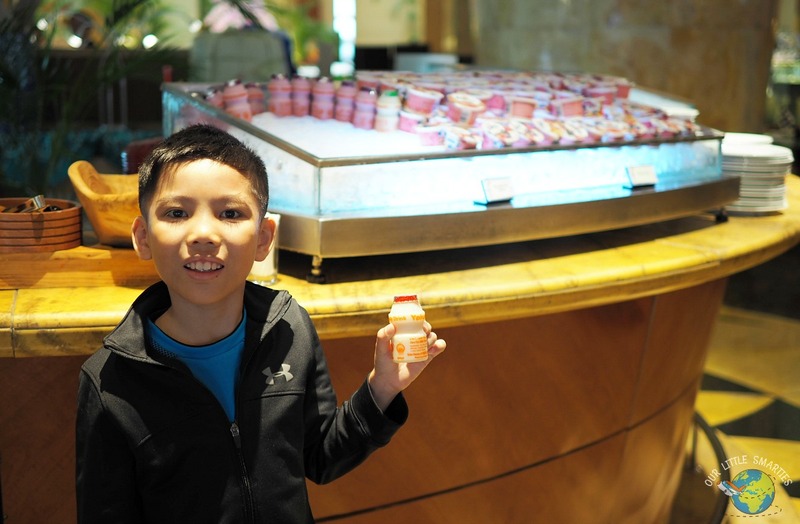 Being a newly minted Singaporean, I truly enjoyed The Fullerton Monument Tour at The Fullerton Hotel and A Maritime Journey Tour at The Fullerton Bay Hotel. Do you know that in 2015, the National Heritage Board (NHB) gazetted the former Fullerton Building (today known as The Fullerton Hotel) as Singapore’s 71st National Monument? Now, there’s one more reason to visit this iconic colonial building that is filled with many priceless memories of our nation’s growth. The Hotel has 6 dining options with different gastronomies and environments. The Town Restaurant, with its amazing view of the Singapore River and surrounding parks, is an all-day dining restaurant that serves power breakfast, ala-carte signatures and hearty buffets for lunch and dinner. This vibrant restaurant is where the majority of the guests enjoy their daily breakfasts with one of the biggest varieties in town. Now, let’s talk about breakfast. 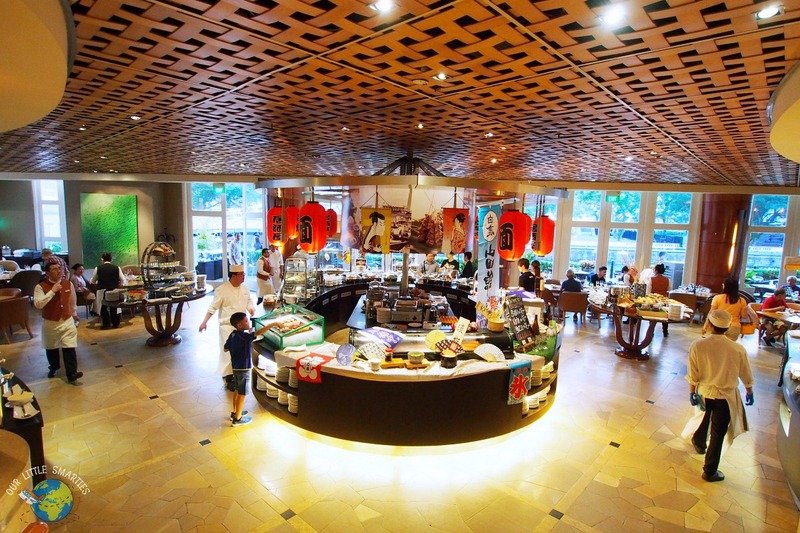 Western, Japanese, Malay, Indian and Chinese cuisine – you’ll definitely be able to satisfy your breakfast cravings from the wide selection of food. It’s certainly the most enjoyable hotel buffet breakfast in 2017! I love the spread and focus on local taste such as Heritage Local Coffee, toast bread and soft-boiled eggs. After all, they are still our well-loved comfort food. Free-flow of Yakult and yoghurts! 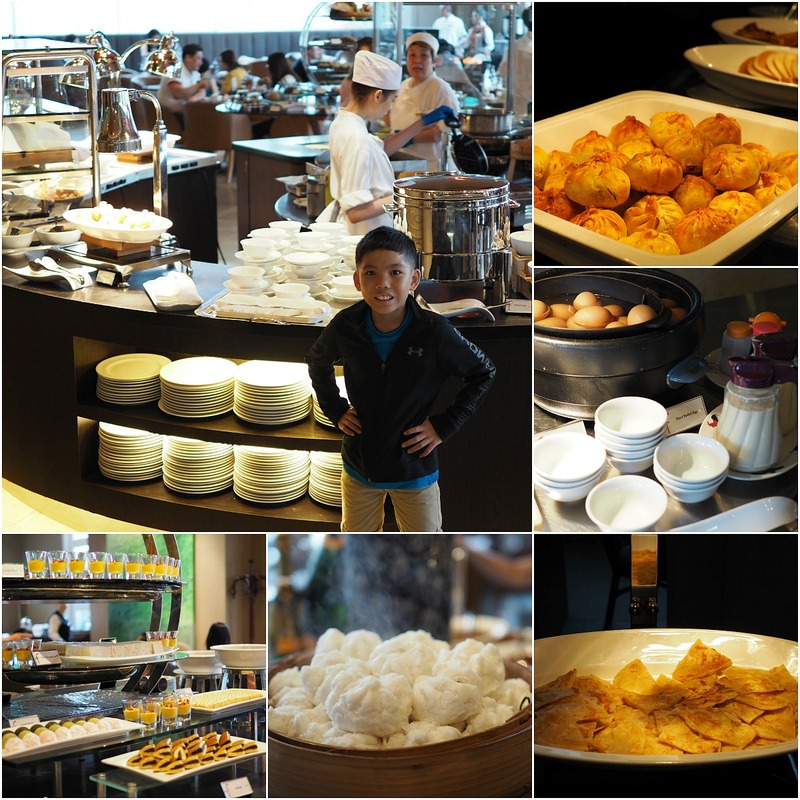 During our stay, we also tried the Themed Buffet Dinner as there’s a 30% discount for hotel guests. We enjoyed the seafood SO much, the lobsters were fresh and sweet, so are the prawns and oysters. The seafood didn’t end here, we were glad to find a dedicated Japanese food corner with freshly sliced sashimi such as salmon, swordfish, tuna and red snapper. For the heavier options, we also loved the Wagyu beef, signature laksa and Hainanese chicken. The food quality was definitely there, coupled with great service from the staffs. 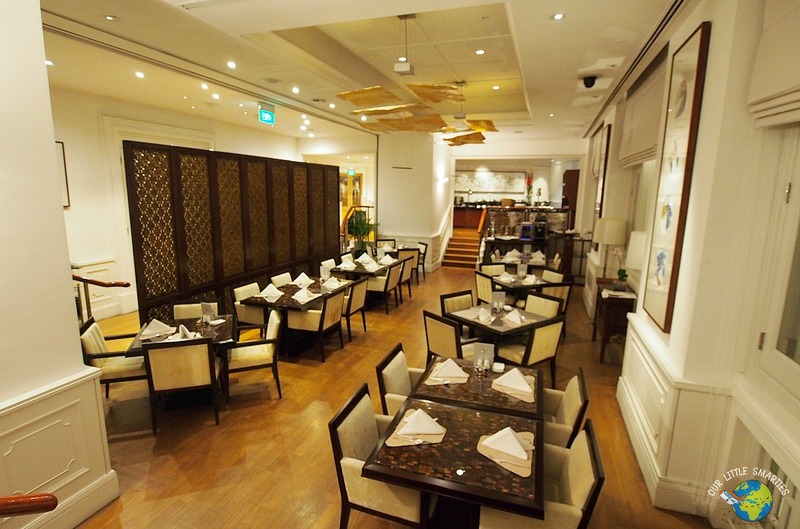 The Jade, a restaurant of Singapore Cantonese-style cuisine, offers a gourmet menu revitalised by Chinese Executive Chef Leong Chee Yeng. The Post Bar is a trendy bar with the most modern decor of The Fullerton Hotel, skilled in cocktails, with the signature Slings and light dishes, in an environment proper for business and a nice evening. 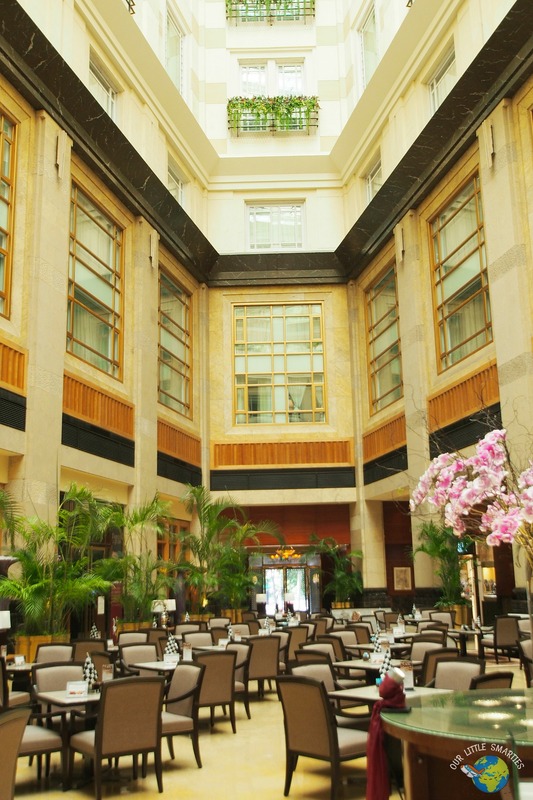 The Courtyard, which occupies a great part of the central patio of the Hotel, is an ideal place for a leisurely afternoon tea and light meals. 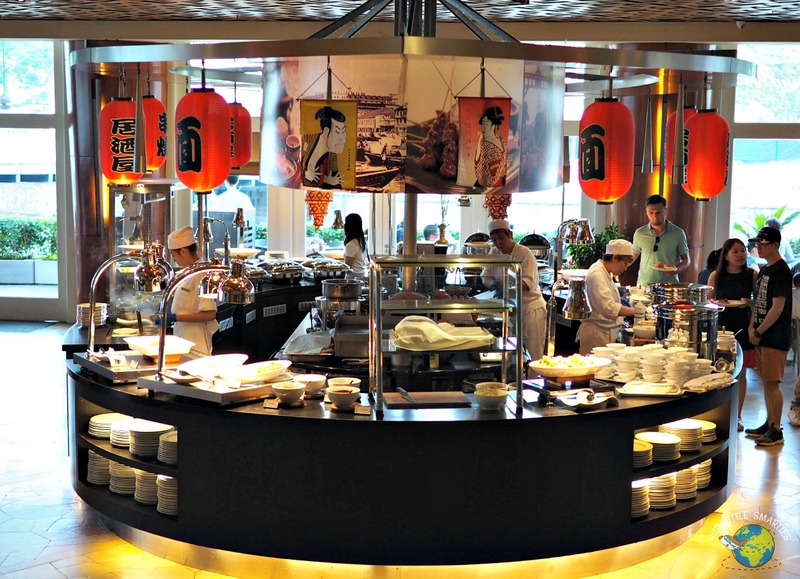 It also serves Japanese and Indian Curry Buffets on the weekdays. 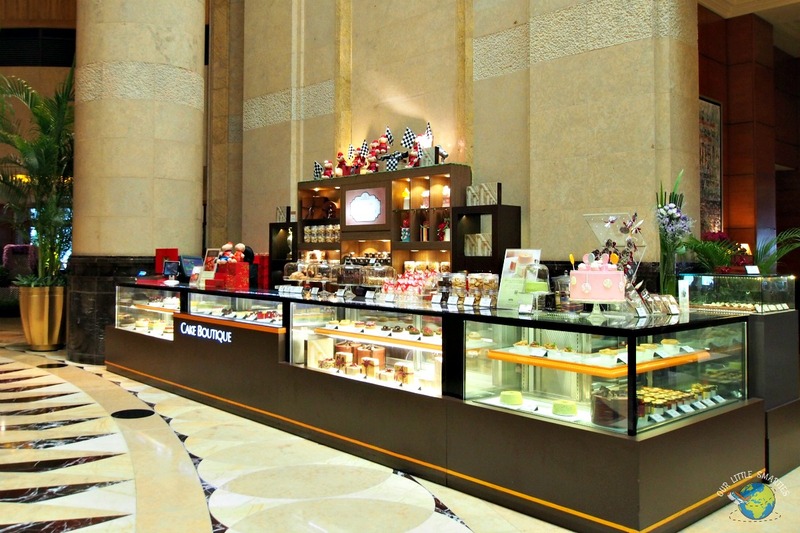 The Fullerton Cake Boutique works as a true French pâtisserie, where guests can enjoy delightful homemade cakes and pastries carefully prepared by the pastry team of the hotel. 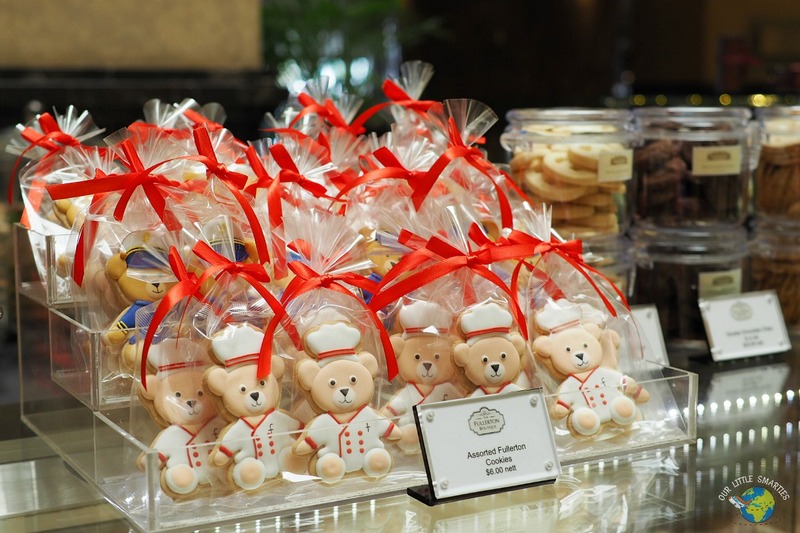 Edison was SO thrilled to see the cute Fullerton Bear cookies here. Seriously, who wants to bite on these eye candies! I’d rather keep them. Lastly, the most romantic restaurant of the hotel is located on the highest spot, more precisely at the former lighthouse once used to guide ships heading to the city, and now it’s the The Lighthouse Restaurant & Rooftop Bar. It’s the perfect place to catch the nightly Marina Bay Light Show. Viewing times: 8pm and 9pm (Sunday to Thursday) | 8pm, 9pm and 10pm (Friday and Saturday). Powered by advanced lasers, fountain jets and visual projectors, the 15-minute show combines dancing water fountains, colourful visual arts, orchestral soundtrack and special lighting effects. The hotel offers all the facilities and services of a luxurious five-star, such as the concierge service, 24h room service, WIFI, shuttles to main areas of town, and a post office, staying true to the hotel’s history – allowing the guests to send postcards and letters to anywhere in the world with the stamp of the hotel. 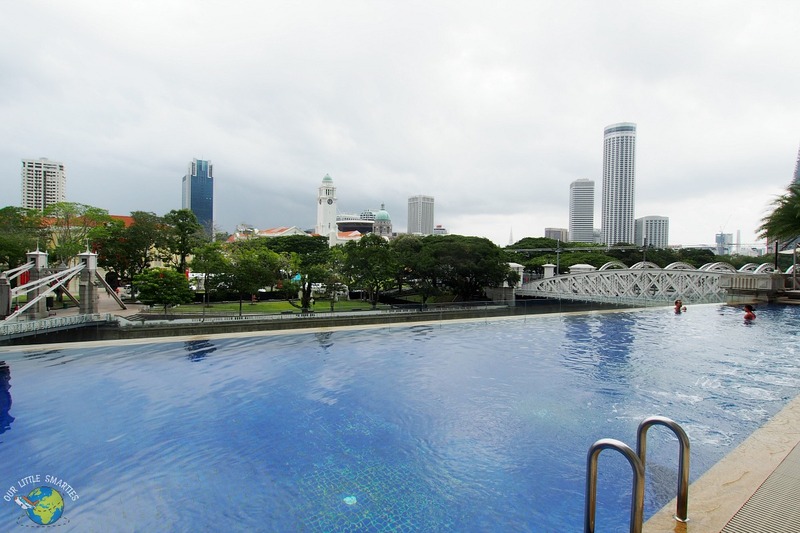 The 25-metre outdoor infinity pool that overlooks the charming Singapore River is simply beautiful. The Fitness Centre features the latest gym equipment, and The Fullerton Spa provides guests with a unique moment of relaxation. Despite being an extremely big hotel, with guests coming in and out every second, the friendly hotel staffs never fail to ensure a perfect execution of all our needs and requests. Whenever I called the front desk, they addressed me by my name which is very nice. Simple gesture like this makes a memorable impact to me. If you’re looking for a staycation that makes you feel completely spoilt or to celebrate a special occasion, I’d highly recommend The Fullerton Hotel. From lavish rooms to luxurious spa, family-friendly facilities to five-star cuisine, the pampered experience is unsurpassed. During the day, I enjoyed a panoramic view of Singapore’s best landmarks. When night falls, the lights from the Marina Bay Light Show came on to create an ethereal skyline. 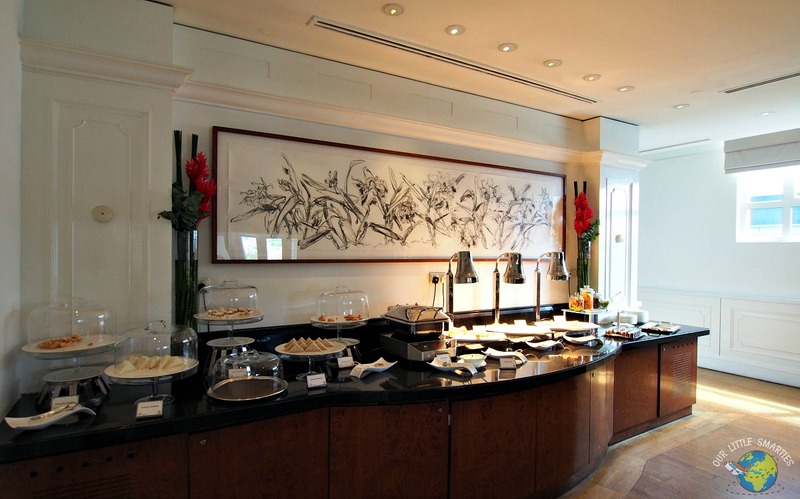 For foodie lover like us, the breakfast buffet alone is enough to make our stay worthwhile. 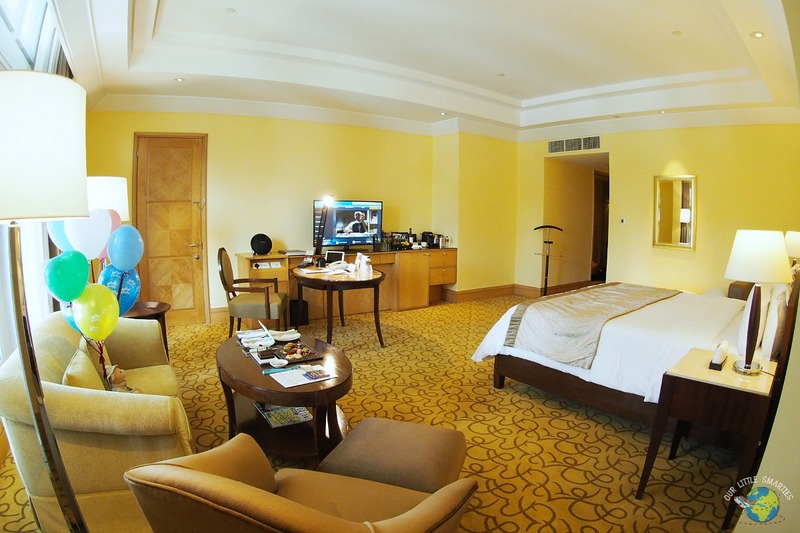 If you’ve some budget, I’d also recommend you to get a Club Room that comes with exclusive club privileges. I realise this post is getting too long, I should have split it up, but for those of you who managed to read it till the end, congrats! I hope you enjoyed it! We’ll definitely be back again. Perhaps The Fullerton Bay Hotel next time. Book your Fullerton Family Package HERE. Disclosure: We received a complimentary stay at The Fullerton Hotel but as always, all views are our own and we definitely enjoyed our stay at the hotel.